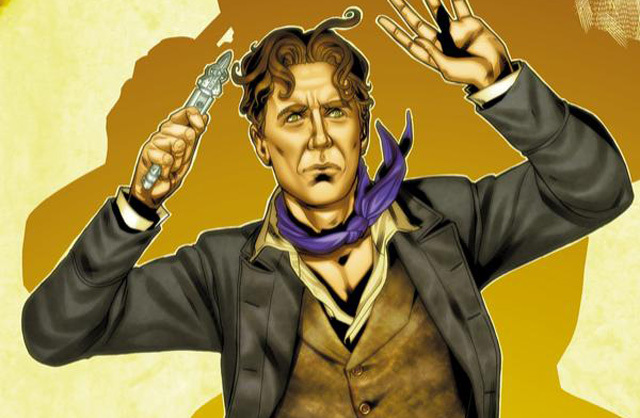 Titan Comics: THE EIGHTH DOCTOR #2 Review | Warped Factor - Words in the Key of Geek. Tony Fyler basks in the Music of the Spherions. In his debut in Titan comic-books, the Eighth Doctor as written by George Mann showed us his Inner Tigger, as seen on screen in his feature-length adventure, and frequently when meeting new people that interest him, from Charlie Pollard to C'rizz to Lucie Bleedin' Miller and Molly O'Sullivan. 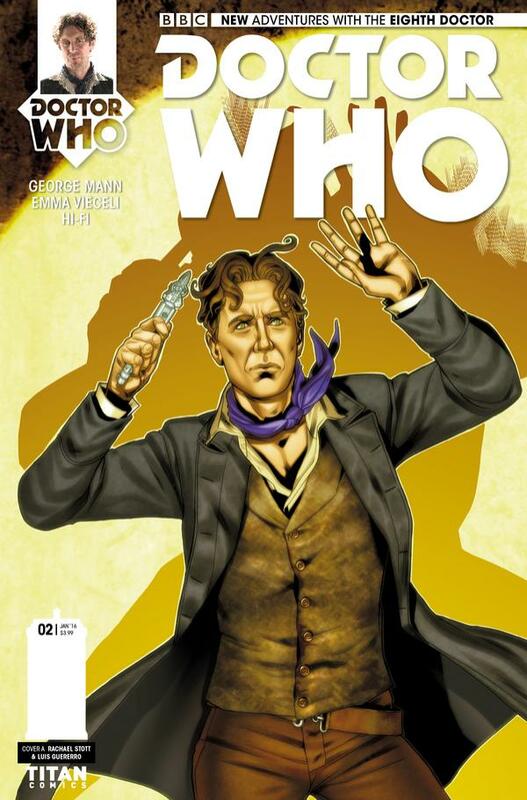 Here in his second one-shot story, Mann shows us a different side of the Eighth Doctor, a distinctly later, Big Finish side (which fits absolutely with where he's supposed to be in his timeline when these comic-book adventures take place). Here he gives us the McGann Doctor capable of high-handedness, and a kind of exhaustion with the business of war that can make him snappy with people, a dark shadow given what we know of his future. This Doctor can be hectoring of whole species at a time if he thinks they're devoted to war, displaying a Time Lord arrogance, and here, he lays his judgement on the Calaxi - kind of blue, catlike species - even though they're the ones under attack from the skies. The Calaxi face a planetwide bombardment from the crystalline Spherions, a rain of crystal shards that don't kill, but turn species into more Spherions. There's a Cyberman inevitability to this threat. If you think it's just a matter of avoiding the bombardment, imagine Dark Water, turning you into something entirely other than yourself. Then go out in a storm, and try to dodge the raindrops. When new companion Josie gets a shard of crystal embedded in her leg, the clock begins ticking on the Doctor's personal involvement - and the Eighth Doctor here channels a very New Who urgency into his Classic Who concern, thinking fast, solving problems that have dogged the Calaxi for generations, yes because the Calaxi are suffering, but most particularly because Josie, the girl he accidentally brought to a warzone, is going to suffer, to hurt, to eventually become a Spherion. There's also a New Who vibe in the solution, inasmuch as the Doctor pushes things right to the limit of his time, and then something else happens to take things out of his hands, and force him to trust beyond his own abilities to control the situation. The solution, when it comes, elevates not only the moment of crisis into a scream against a seeming inevitability, and then a simple plea for trust and compassion, but also impresses with the nature of both species involved in the conflict, and the nature of the reward, which is, apart from the ending you were hoping for, a kind of expanded consciousness that sings of hope even between seemingly implacable foes. It’s the kind of escapist Who you pick up to be taken out of the day to day world, and dream of better things. Emma Vieceli’s artwork and Hi-Fi’s colourwork this time out are lush and not a little trippy – the Calaxi, living a kind of refugee life as they hide from the Spherions, have dwellings that are rendered as a curious amalgum of Hobbit houses and cans of Spam fashioned into something with more than a hint of VW campervan about them (C’mon, get your wallets out, you want to see those now, don’t you?). The planet itself and the bombardment of the Spherions are likewise beautifully, organically, even fluidly rendered, the colours those of long ago annual stories that would always spark the imagination, almost because no-one would necessarily over-analyse them, so they were free to be beautiful and weird just for their own sake. It remains true that the more classically good-looking of the Doctors appear to be the hardest to capture in comic-book form – as with David Tennant, so with Paul McGann, you have to use quite a bit of imagination to go beyond a costume and say ‘Oh yes, there’s McGann,’ but Mann is a tremendous help in this regard, giving the Eighth Doctor’s speeches a rhythm that absolutely drip with McGann’s cadences. Artistically, it’s almost like the pairing of Vieceli and Hi-Fi are more free to be inspired when tasked to create a world and a situation from the ground up than they were last time within the strictures of an Earth-bound story. The effect is gloriously pleasing, like birdsong in December, Mann’s script brought to loving-coloured life – a fitting tribute to what really is going on, and the ultimate song of the Spherions. You’re going to get this one for the appeal of new Eighth Doctor stories – and perhaps for slightly less sturm und drang than he undergoes in audio now he’s become a box set sensation. Mann doesn’t disappoint his reader, giving an authentic McGann-voiced Doctor his reins and letting him New Who it up a little. Josie too is impressive here, with the hallmarks of a Rose or an Amy. What’s at least as much, the artwork and colour seems to embrace the grand spirit of adventure of Who in general and this Doctor in particular. So go, listen to the Music of the Spherions today. There’s every chance it’s a song to which you’ll find yourself returning, time and time again.